With the rising of the number of internet users today, getting things accessible online, I would say, is a must. Remember those days when we still rely on a slow network connection through LAN cable with that loud noises? Even so, we still connect to it anyway. Talking about internet, means, we are talking about globalization. People exchange information online, shop online, e-mail, e-card, everything almost in an online format. Even you and me, far apart in different countries, we are still able to keep in touch online through social sharing platforms. So, what’s the fuss that actually you are going to talk about? As shown on the title, it is about web hosting. Haha..! I mean seriously, isn’t it so important to get a reliable hosting company to host our content online since everything is up online now? And that is the problem. When demand is high and provider is plenty, we find it hard to decide to which web hosting company we shall trust our information to. Be it for personal use or business, we hope to get the best return with the amount of fund we invest to them every month. Wait a minute. Web hosting? Yeap, web hosting. It is a ‘house’ where we store the information that we would like to share with the world. Like my blog that you are reading right now, all the information, photos and everything you see here, the content are stored on a server owned by a hosting company. We definitely want to look for a house that is safe and secure so that it is difficult for thief to enter and steal or do something harmful to us. It’s same when it comes to choosing a hosting company as well. After two years blogging and changed hosting company for several times, I understand very well the hectic of maintaining a website. The hardest it can be, it still can not be worse than getting an unreliable hosting company. Server down fortnightly; customer service is not reachable when we need support. These twos are enough to make our life difficult. 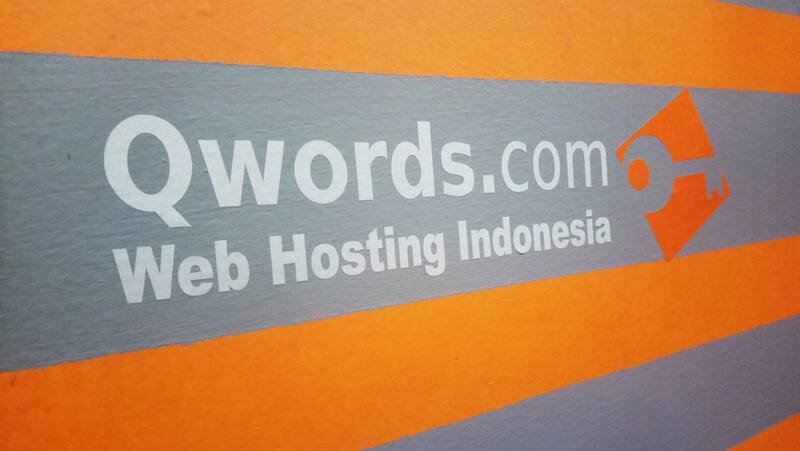 So, up to here, I would like to introduce one web hosting company based in Indonesia named Qwords which has been established since 2005. Last week, they celebrated their 12th anniversary across their offices in Bandung, Surabaya, Jakarta, and Yogyakarta at the same times. They have been servicing clients from various industry for more than a decade. I was there to join the celebration and all guests were introduced to their products and services and also invited to have a look at the data center of Qwords. Qwords Jakarta is located on the 3rd floor of Cyber 1 Building in Kuningan Barat which also serves as the main data center of Qwords with the office in Surabaya as the backup center. Does the physical location of our server matter? Well, some say that usually the closer the website visitor is to the web server, the fewer networks the data passes through. Common sense is the closer it is to us, the lesser time the data takes to travel to us. How true is it? Do try to find out. Products and services offered by Qwords are not only limited to domain and cloud web hosting services but also extended to other services such as ECCS, G Suite and Office 365 to compliment our productivity. ECCS (Email Cloud Collaboration Suite) is Qwords’ own email client system that comes with comprehensive features as shown above. While G Suite and Office 365 are obvious enough belong to Google and Microsoft respectively. However, to save the hassle, if clients choose to use G Suite or Office 365, be it for personal or business purposes, Qwords does offer service to maintain the subscription account on behalf of the clients. Besides that, one more product that has become more important to have especially if we run e-commerce sites is the SSL (Security Sockets Layer). SSL is the standard security technology for establishing an encrypted link between a web server and a browser. This SSL certification can be obtained through Qwords, too. Major sites like Paypal, Facebook, and Adobe websites are SSL certified. This can be identified by the green color lock icon shown on the browser column before the web address. To find out the pricing and what other products and services Qwords have to offer, do head on to their website. Or follow Qwords on Instagram to stay updated with their latest promotion! Which hosting company are you currently using? Is their data center located in the same country as where you are? Do feel free to share in the comment box below.